MC: Maps! Welcome to your world! 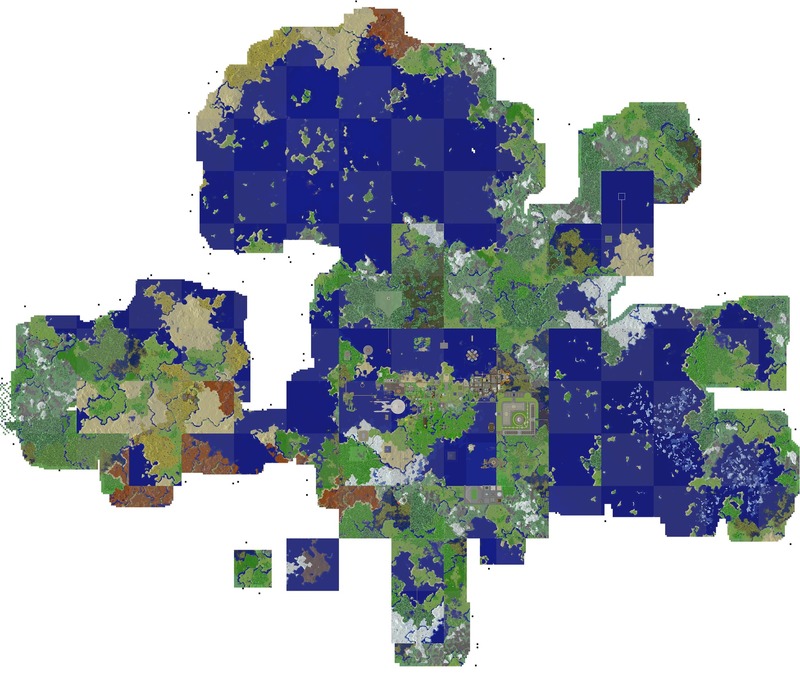 FWIW, if we did want to give Overviewer a spin for the big maps, its 1.13 format support is still a little buggy (and unreleased; I had to build from a development branch here too), but at least it renders. Also, it dropped the Google Maps API in favor of Leaflet, a free open-source alternative. It zooms and pans and generally feels just like Google Maps. Switching to Leaflet gets around the un-free licensing problem that killed our last round of maps. I just want to say, preemptively, I'm sorry. I did go out to check if the mesas were still there. They were. I don't know why I was so concerned. I swore I wouldn't do world bloat this time around yet here I am. Yeah, I've starting thinking beyond our old map developer now. With Christmas coming and all my family obligations I haven't put much into alternatives just yet. The dev said he hopes to convert from Google to Leaflet and show to to convert the old maps over as well. If so I can even restore the archives! I won't rule out switching to Overviewer, I just like it a lot less than Tectonicus. I will say, the last time I did switch there was an issue with scripting it. I don't recall the issue at the moment, but I do recall there being one. Man that ~20 minutes that we all take to get a grip on Elytra is SO stressful... I'm just glad I was there to watch someone else doing it. Gotta give it to arteggio though, once up and flying he was able to follow/lead like a pro. 709: "Okay, just jump and press the 'go' button." Arteggio: "There's a 'go' button?" Me: "It's right next to the 'stop' button." 709: "Don't listen to him. Don't EVER listen to him." 709: "You forgot to jump." Arteggio: "So, I just jump?" 709: "Yes, and then press 'go'." Arteggio: "Wait, I can't find this 'go' button." 709: "I mean the …"
Me: "Jump up and down, rub your belly, spin around three times, and shout 'oogablooga'." Me: "Go to a high place. Jump off. Press 'jump'. Right click a rocket. Fly." I wasn't watching, but it was fun to "watch". I recall having the same trouble. 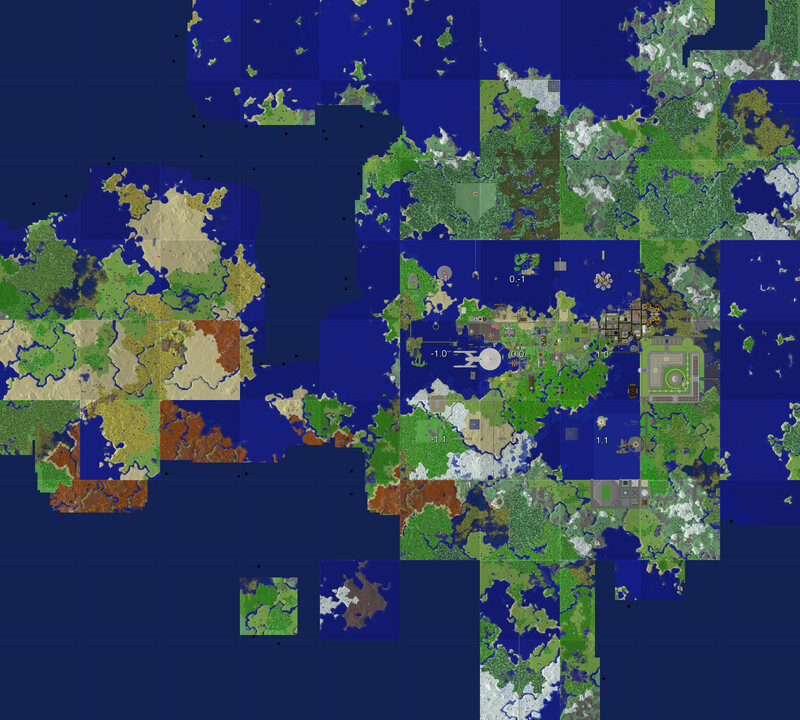 Here's the main landmass scaled down to 25% each direction. So, at this scale, 1x1 pixel = 4x4 blocks. The checkerboard pattern just indicates region file areas. Ideally, one would settle in the dead center of a region, making it easier to decide what regions to save when we prune. Thanks a ton for the map! !